So the NZOI January Camp 2018 finished last weekend, and I’m finally awake again and ready to write up a blog post! This year, we had 28 students from incoming year 9 to outgoing year 13 travel from all over the country to attend camp at the University of Canterbury. Split into two groups - one learning how to program in C++, and one learning about various algorithms and techniques - the students had a week full of lectures and problem solving. Thanks to Tim Bell, Neil Leslie, Richard Lobb, Alan, Suzanne, and Margot for keeping students entertained all day, and thanks to Michael, Iain, Harry, and Thomas for helping to answer the students’ innumerable questions during tutorial sessions. I think that all of the students learnt a lot - there’s a page on our training site where I can see that a good number of problems from every set were solved, and as I write this post more submissions are continuing to come in from enthusiastic students. In an attempt to keep the students out of mischief, we had organised activities almost every night. The evenings were occupied by an informatics quiz (with problems from the Olympiad of Metropolises), some interesting short talks (on Steganography and Mo’s Algorithm), a technology challenge (competing to build the best balloon powered racer), a quiz night (round topics: Geography/History, 1980s, Literature/Music/Movies, Stevie Nicks, General Knowledge, and Logic), and many many card games (have you heard of Bartók?). Between this and an afternoon excursion to the swimming pool at Jelly Park, hopefully no one will be accused of sitting in front of a computer screen all week! The students are now training for the upcoming AIIO and FARIO contests, after which the team will be selected to travel to the IOI’18 in Tsukuba, Ibaraki, Japan. Thanks again to all the lecturers and tutors involved, thanks to Tom for help with contest problem writing, and thanks to Margot and Thomas for organising all of the things beforehand! If you’re a student who didn’t go to camp, but who thinks this sounds fun, then participate in NZIC! It’s a free online competition, run throughout the year, with some problems approachable to newcomers and some hard ones to work towards. NZIC participants will be contacted towards the end of the year about selection for January Camp 2019. The annual NZOI January Camp for 2017 has come to a close. 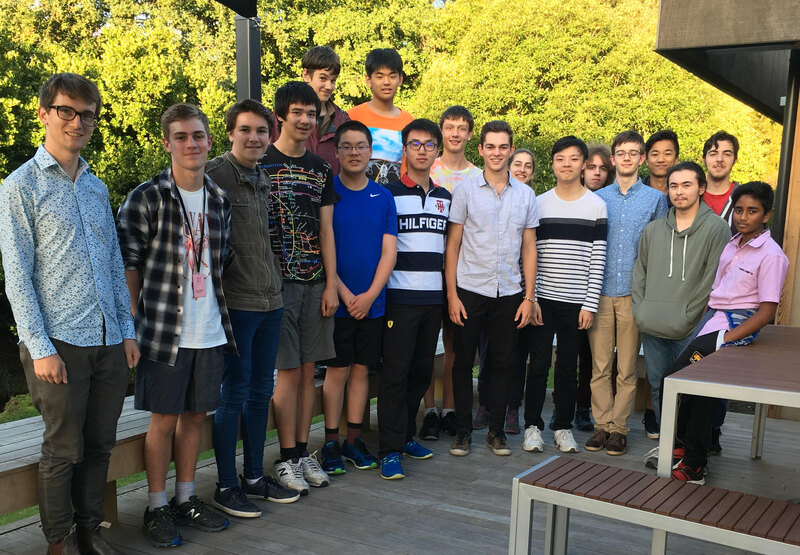 Students from around New Zealand have spent a week learning new algorithms and languages, using them to solve problems, coding up those solutions, debugging them, and submitting them - hopefully to receive the coveted response: All Correct! 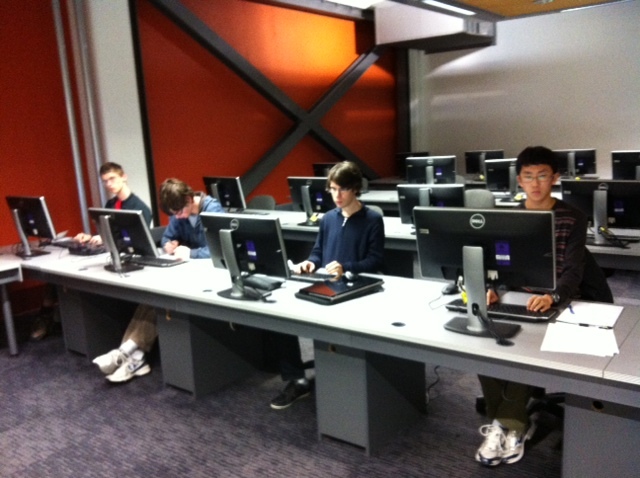 Students of all experience levels attended, and were split into three streams. The Juniors came in knowing the Python they had learnt in school and spent the week learning C++, the most popular language at the IOI. The Intermediates came in already knowing some C++, and during the camp they learnt all about algorithms, from graph theory to dynamic programming to computational geometry. 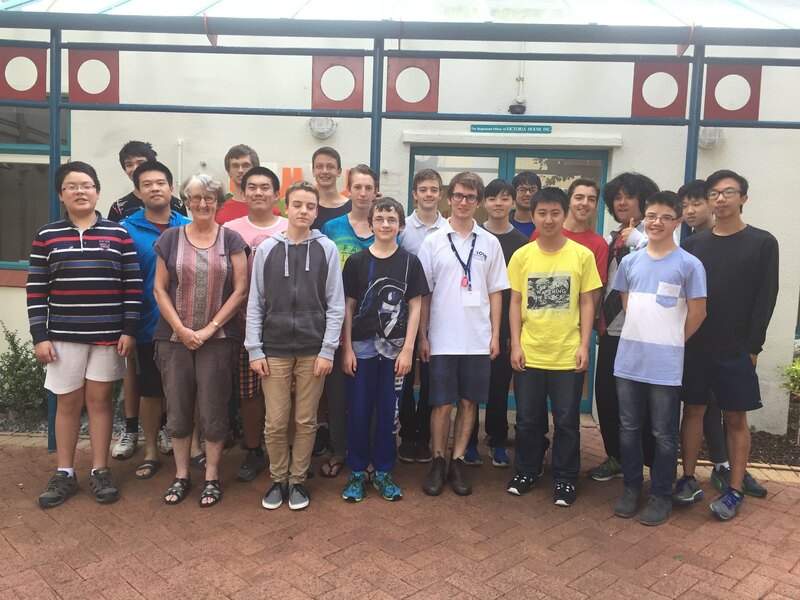 The Seniors have already leant all of the Intermediate material, and spent most of the camp practicing on hard problems (including a particular problem about fish), with some advanced lectures interspersed. We had a great bunch of students attend this year. They’re probably one of the most keen groups I’ve seen, and even spent some evenings voluntarily spending their free time solving more problems! I think that all of the tutors would agree, they were a pleasure to teach. I’d like to give a huge thank you to all of the tutors and organising staff involved: Andrew, Margot, Neil, Suzanne, Simon, Tim, Thomas, and Victor. Without all of them, such a great camp would not have been possible. 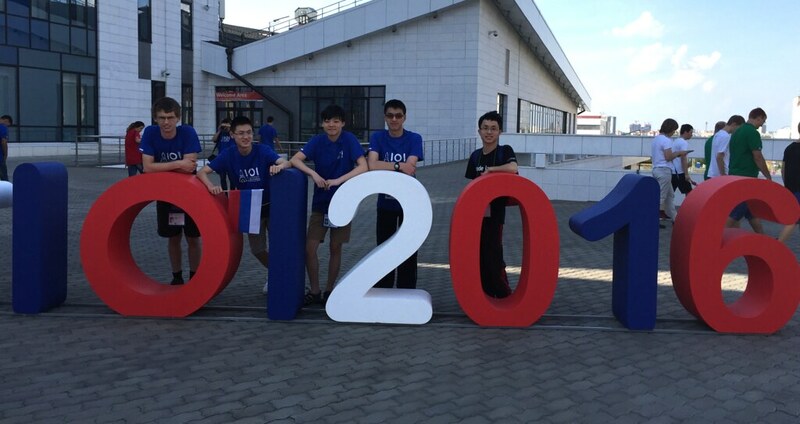 The 28th IOI was held in Kazan, Russia from August 12 to August 19 2016. 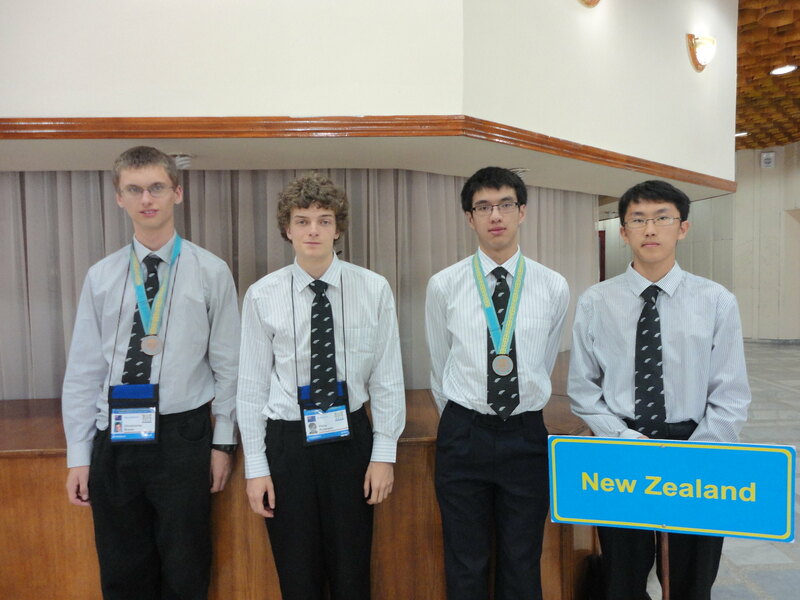 The New Zealand team for 2016, consisted of Jonathan Khoo (Mount Roskill Grammar), Christopher Brown (Christ’s College), Andrew Chen (Auckland International College) and Chris Jung (Christ’s College). There were 2 competition days where 3 problems are presented each day with 5 hours to solve them. Sub tasks can be attempted in any problem for partial marks. Tension was high on the first contest day when Jonathan successfully completed the first problem with the full 100 points, following up with 64 points in the second problem and 23 points in the third problem. After two days of competition, Jonathan Khoo and Andrew Chen both won bronze medals, scoring 293 and 238 points respectively. Out of 308 official contestants from 81 countries, Jonathan placed 104th, and Andrew placed 145th. Christopher scored 238 placing 156th, and Chris Jung scored 154, placing 215th. This is an excellent result from the team, despite Chris spending two nights in a Russian hospital with suspected pneumonia! The next IOI will be held in Tehran, Iran from July 28 to August 4. Thanks to our sponsors for making the trip possible. A big thank you also to Ronald Chan for all his work and time spent running the selection contests, selecting the team, and his efforts all year in training the team for this contest. The 27th IOI was held in Almaty, Kazakhstan from July 26 to August 2. The New Zealand team for 2015, consisted of Jonathan Khoo (Mount Roskill Grammar), Christopher Brown (Christ’s College), Byung Hoon Cho (Auckland Grammar) and Philip Anderson (King’s High School). While spectators may have been worried when Christopher was still at only 20 points 2.5 hours into the first day, he pulled through in the end. After two days of competition, each 5 hours long with 3 problems worth 100 points, Jonathan Khoo and Christopher Brown both won bronze medals, scoring 256.42 and 238.42 respectively. Out of 322 official contestants from over 80 countries, Jonathan placed 120th, and Christopher placed 134th. This is an excellent result, particularly since this is Jonathan’s first year competing in the IOI. Byung Hoon Cho scored 145.46 placing 190th, and Philip Anderson scored 118, placing 218th. Apart from the competition days, we had two excursions, attending the Kazakh State Circus, and acquainting ourselves with the local Kazakh customs and traditions. The next IOI will be held in Kazan, Russia. As Jonathan and Christopher are both still only year 12, we are looking forward to seeing how well they can do next year. The 2014 IOI was held in Taipei, Taiwan from July 13 to July 20. 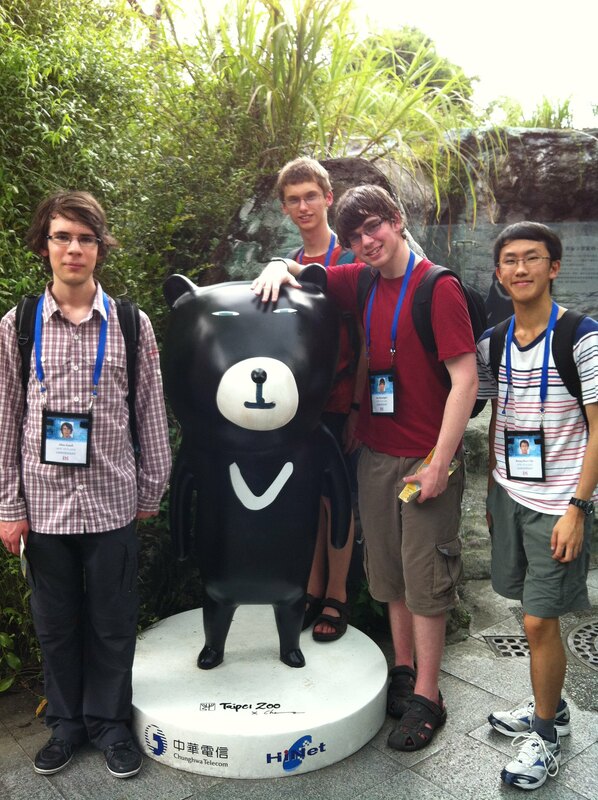 The New Zealand team consisted of Alan Ansell (Auckland University), Christopher Brown (Christs College), Byung Hoon Cho (Auckland Grammar) and Tate Kennington (James Hargest). They were accompanied by Ronald Chan (leader) and Margot Phillipps (deputy leader). The team gathered in Auckland for extra training on July 6 and left for Taiwan on the 11th. There were 2 competition days, July 15 and 17, where 3 problems are presented with 5 hours to solve them. Sub tasks can be attempted in any problem for partial marks. Alan kept us in suspense on the first day, solving one problem for 100 marks with 7 minutes to spare. This put him right on the bronze boundary. The second day he gained a further 127 marks which was sufficient to earn him a bronze medal, placed 149th. The other students were relatively young but have been motivated by their experience to try for a medal in future years. There were 311 contestants and Christopher placed 197 with a combined total of 155, Byung Hoon placed 223rd with 106 and Tate was 269th with 63. The team arrived back rather tired and a day late for school on Tuesday 22 July! Every year before the team leaves to go to camp. The team gets together for some last minute training. We also start to try adopting to the foreign timezone so there’s less catching up to do over there. Congratulations to the New Zealand IOI team for 2014 - Alan Ansell, Christopher Brown , Byung-Hoon Cho and Tate Kennington. With Byung-Cheol Cho as the reserve. There were some hard decisions that had to be made and we hope see see everyone back next year trialling for the team. Keep training ;) A big thanks goes out to all those who help with training our students and the parents who keep helping our students get to camp. With over 25 students coming from all over New Zealand, and a grueling 12 hours spent in the Auckland airport waiting for flights, the summer camp has come to a close. We really want to thank AUT and Grafton Hall, for without them, our camp would not be possible. We also have to thank our generous lecturers and tutors, who give up their time to help educate! We are well in the midst of preparations for NZOI Summer Training Camp, and looking out for students to attend! Secondary school students from all over New Zealand will soon be converging on Auckland, for the annual training and team selection camp. Students live at the prestigious Grafton Hall, and study at the magnificent AUT, and we thank our very generous hosts for the facilities they provide! Our magnificent team have returned from the IOI with two bronze medals, after two tense contest days! Both Tony and Logan have scored bronze medals, with Tony being very close to a silver. Byung-Hoon and Alan Ansell were both very close to medal potential, and we look forward to seeing what they will be doing in the future!